June 2012 – Great News! A PetSmart Charities Grant has allowed us to provide free spay and neuter services for stray cats from Miami Beach! See the schedule for upcoming Miami Beach events. A Miami Foundation Community Grant was just approved and will allow us to provide free spay and neuter services for stray cats from Little Havana beginning in July! Stay tuned for more information. 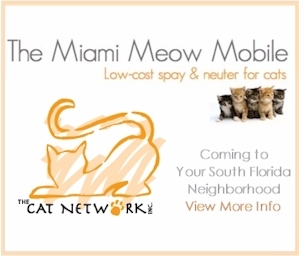 Email us or call 305-233-9958 to schedule an appointment on the Meow Mobile.